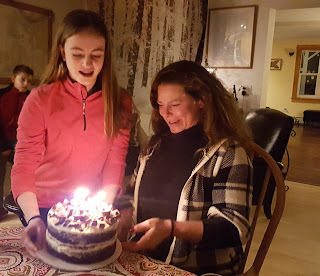 Notes from Val's Kitchen: Light in the Midst of Darkness....Happy Birthday, Sheila! Light in the Midst of Darkness....Happy Birthday, Sheila! January is such a long and dreadful month around here. All of the holiday festivities have long since been over and all we are left with is dreary, gray days- make that short, dreary, gray days and long, dark, cold nights. But there is at least one exciting, fun day to look forward to, for some celebration during all this cold, darkness. It's my friend, Sheila's birthday. Sheila is exuberant, bubbling over with energy and enthusiasm. She is kind and thoughtful and perhaps best of all, she puts all of these qualities into action. Just recently, she pulled her car to the side of the road during her busy workday of sales and travel to jot down lovely thoughts and sentiments about each one of her friends and close family members. Then, instead of keeping these musings to herself, she sent each one of us a copy, neatly typed out, for us to read and cherish. I received mine in the mail the other day. A complete surprise and the perfect antidote to these often depressing January days. Thank you. xo. So, in order to properly celebrate our beautiful friend Sheila, Ava and I constructed this cake. It all began simply as a moist, rich chocolate cake frosted with white buttercream. I thought we might decorate the top with a few crumbles of crushed candy, maybe just along the edge to give it some panache. But somehow that idea just wasn't enough. 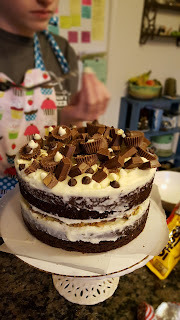 Instead, we opted to mimic Sheila's overflowing, generous personality by putting an abundance of crushed Reece's Peanut Butter Cups and Kit Kat's between the cake and frosting layers. And on top, well, the top is over-the-top and speaks for itself! Happy Birthday, Sheila! Thank you for all of the light you bring into our lives! Preheat oven to 350 degrees. Grease and line the bottoms of two 8 inch cake pans with parchment or wax paper. Grease the paper. In a large mixing bowl, combine all the dry ingredients. Combine all wet ingredients except boiling water in another bowl. Add the wet ingredients to the dry ingredients and stir to combine. Whisk in the boiling water. Pour the batter into prepared pans and bake until a toothpick inserted comes out clean. Begin to check cake around 28 minutes. Once cake is cooked, remove from oven and allow to cool in pans for 10 minutes. Loosen edges and invert onto racks to continue cooling for at least 1 hour before frosting. Using an electric mixer, cream together butter and Crisco. Add the powdered sugar, salt , vanilla and milk as needed for desired consistency. Frost cake as desired and add crushed candy to inner layer. 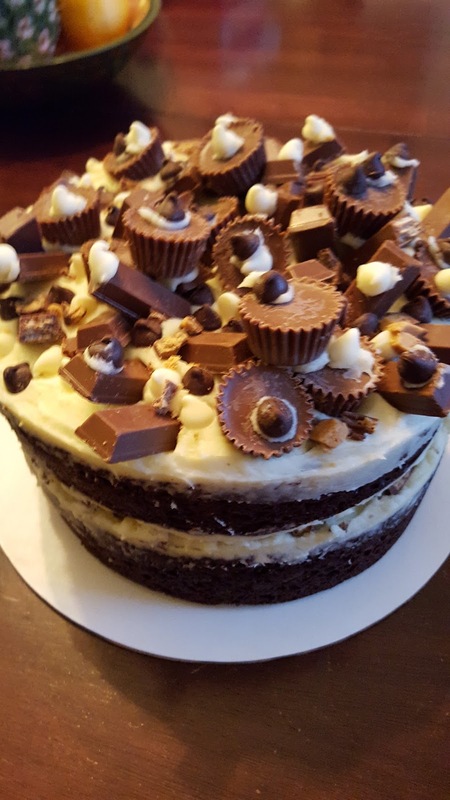 Top cake with broken pieces of candy, white and dark chocolate chips, etc. Keep in a cool place until ready to serve.